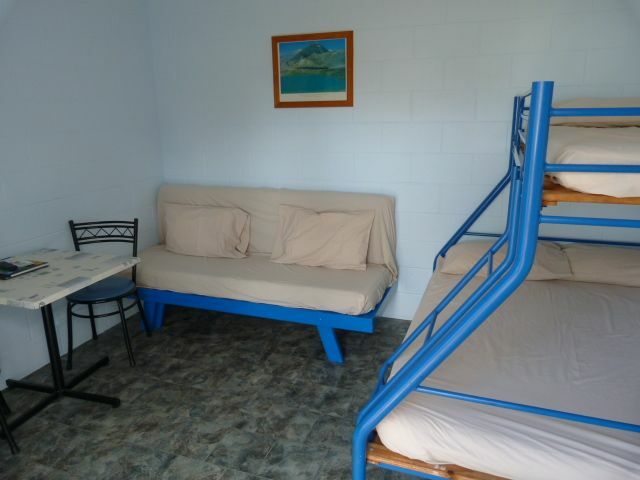 The bedroom has a queen size bed fully made up with towels supplied and a single bed. 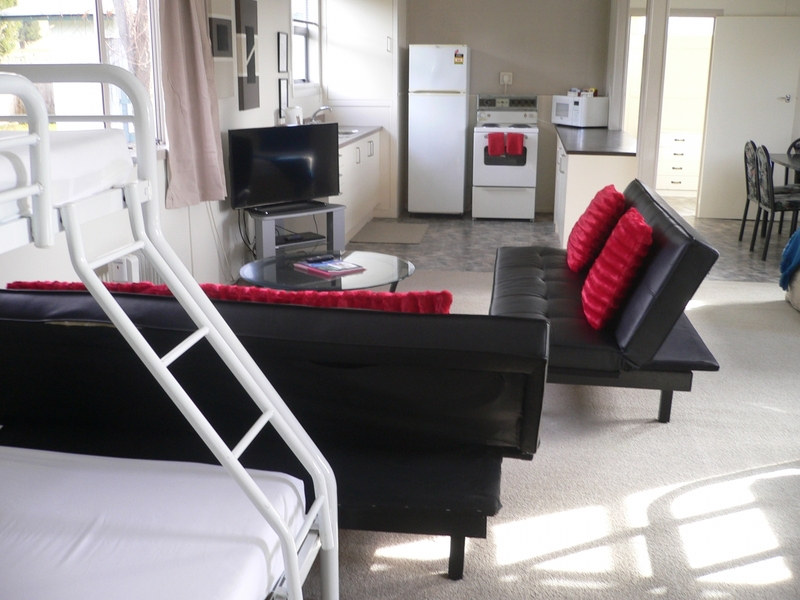 In the living area is another single bed and king single sofa. 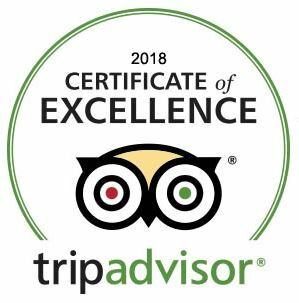 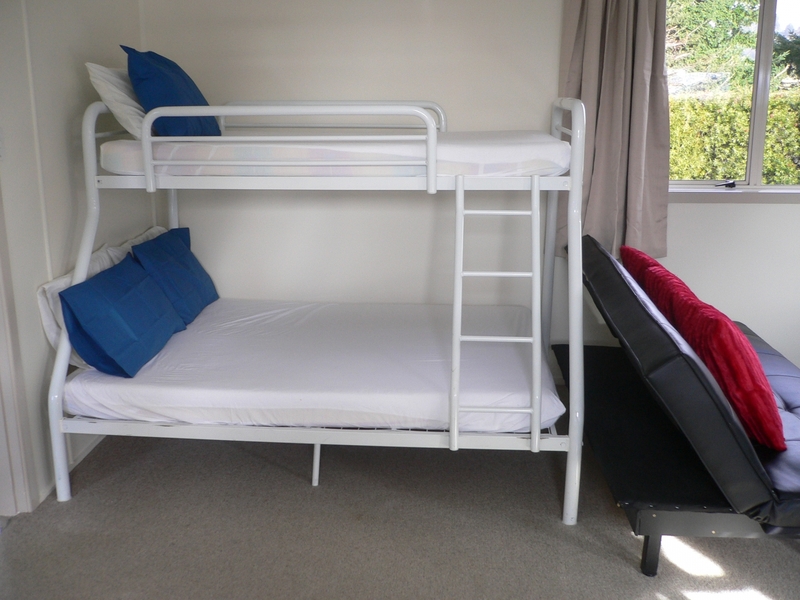 Guests bring sleeping bags/ for single beds, pillows and bottomsheets provided. 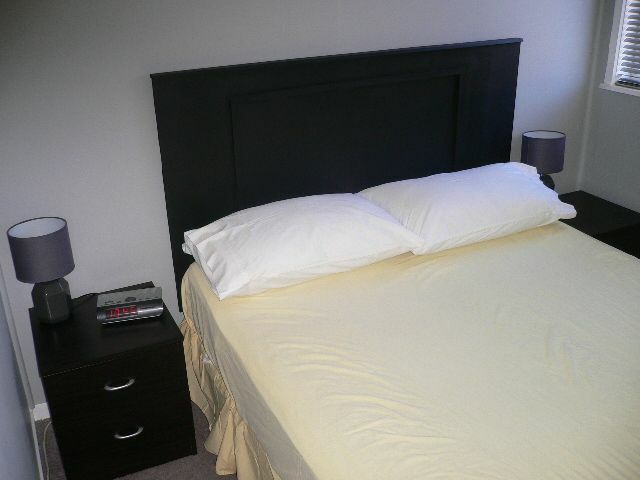 Linen available for hire at $6 per person per night. 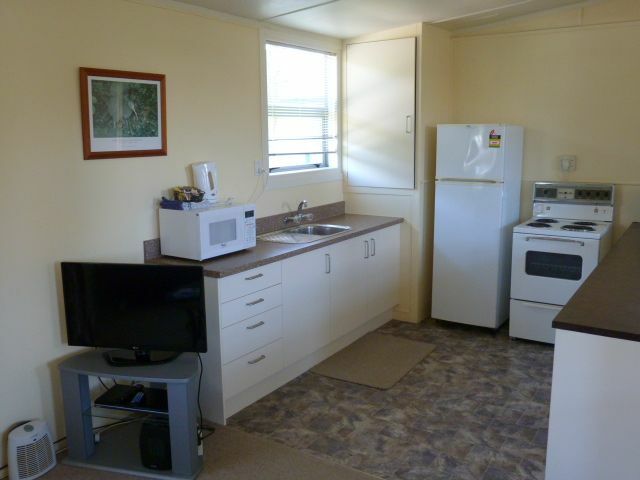 Kitchen with fridge, hot plates, microwave, tea/coffee making facilities, crockery, cutlery & utensils, pots and pans. 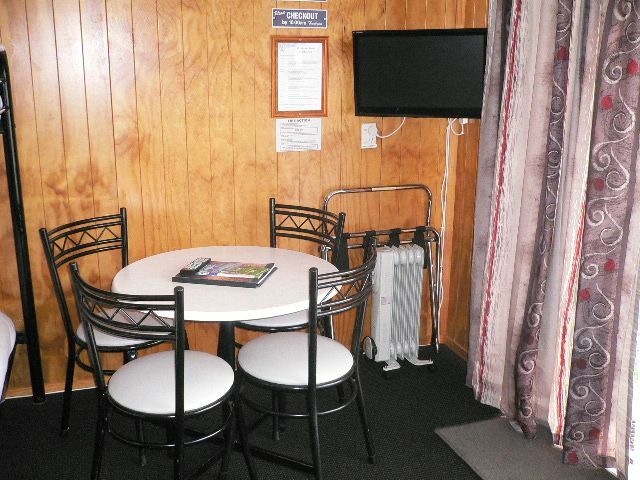 Television, dvd player, heater, table and chairs. 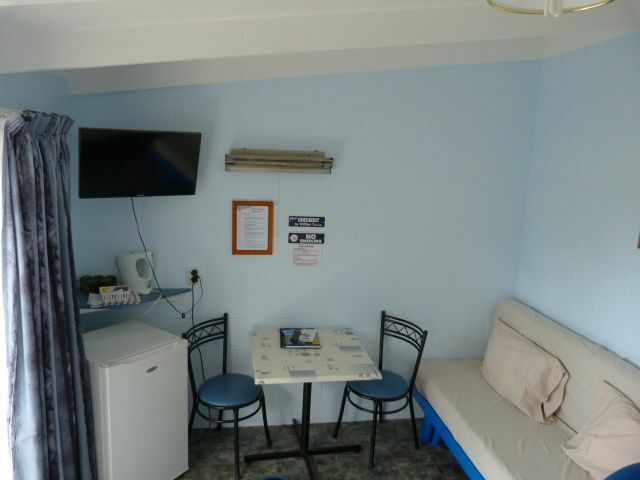 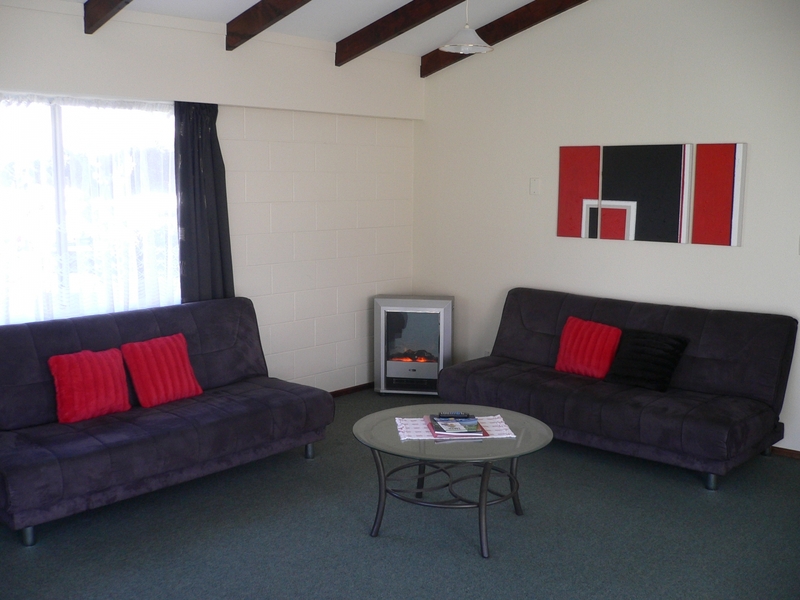 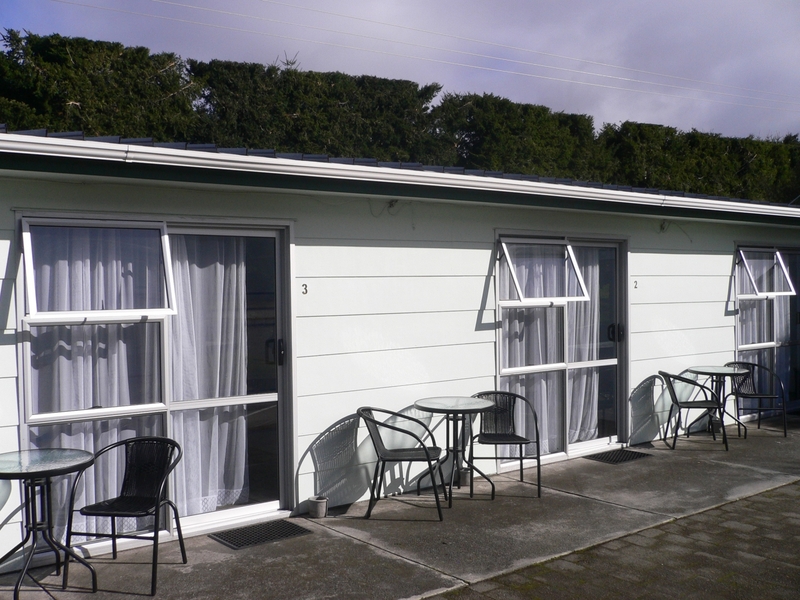 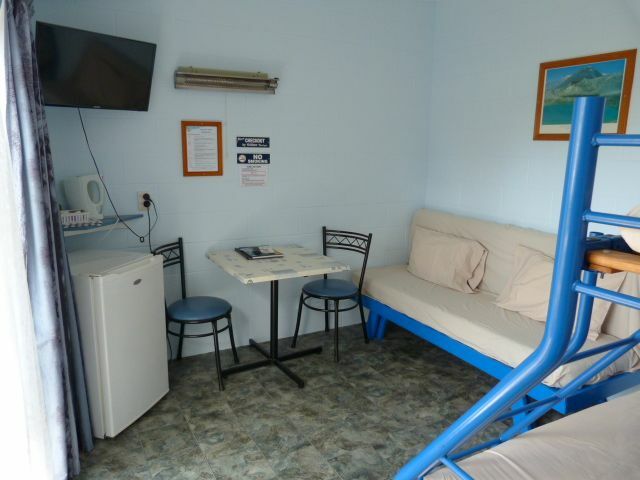 Motel style accommodation, perfect for couples. 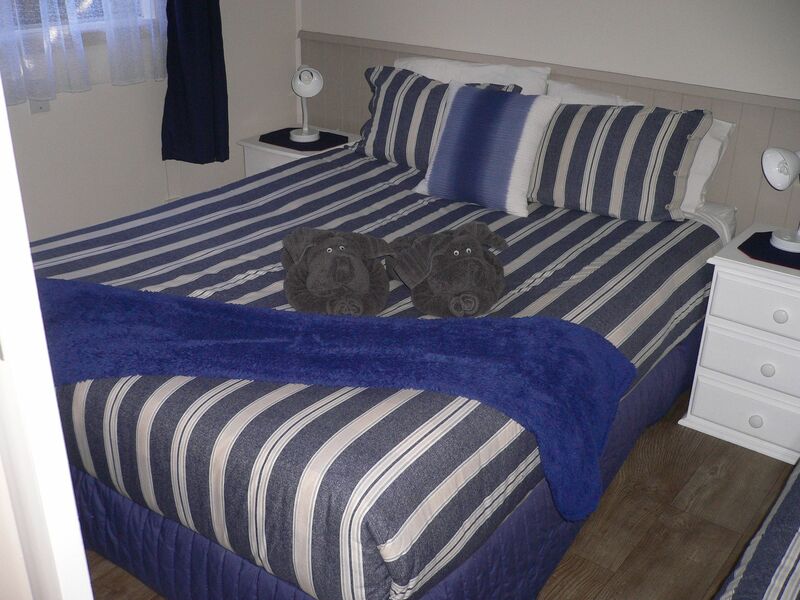 Bedroom with queen size bed fully made up with towels supplied. 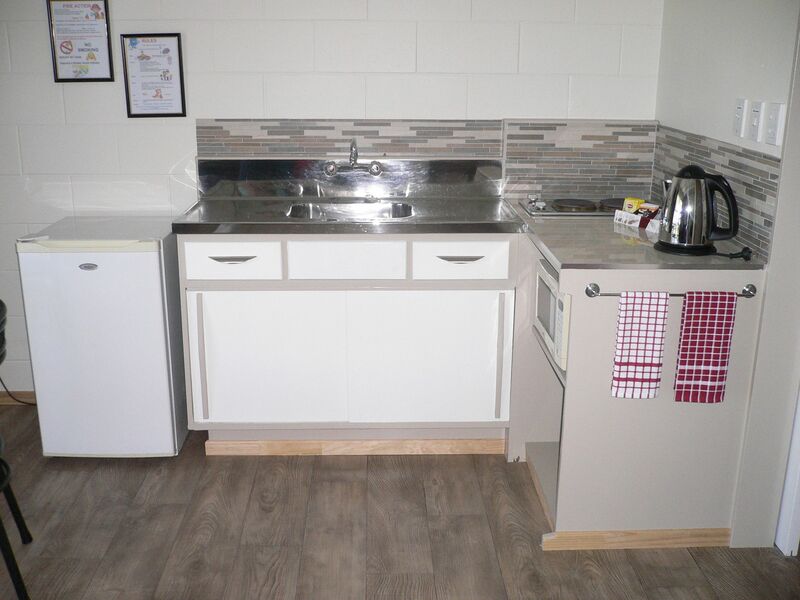 Kitchen with fridge, ceramic hot plates, microwave, tea/coffee making facilities, crockery, cutlery & utensils, pots and pans. 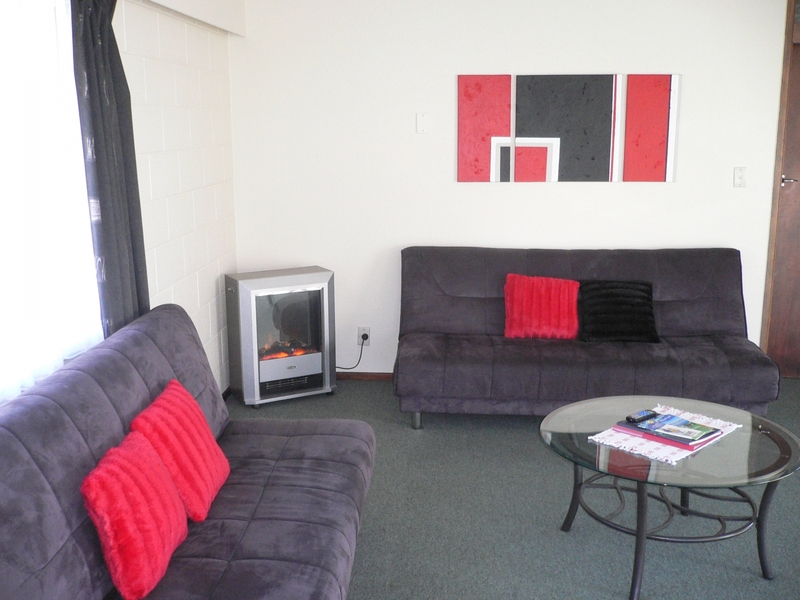 Living area with sofa, television, dvd player, heaters, table & chairs. 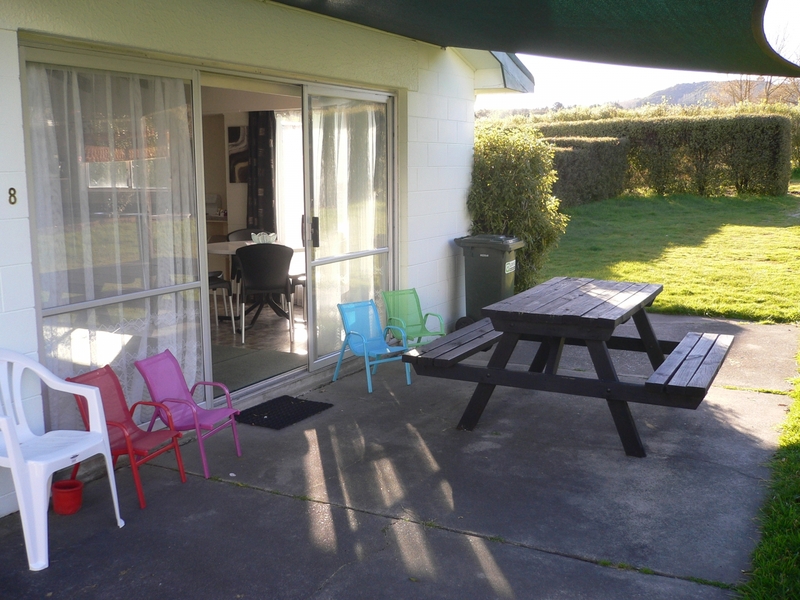 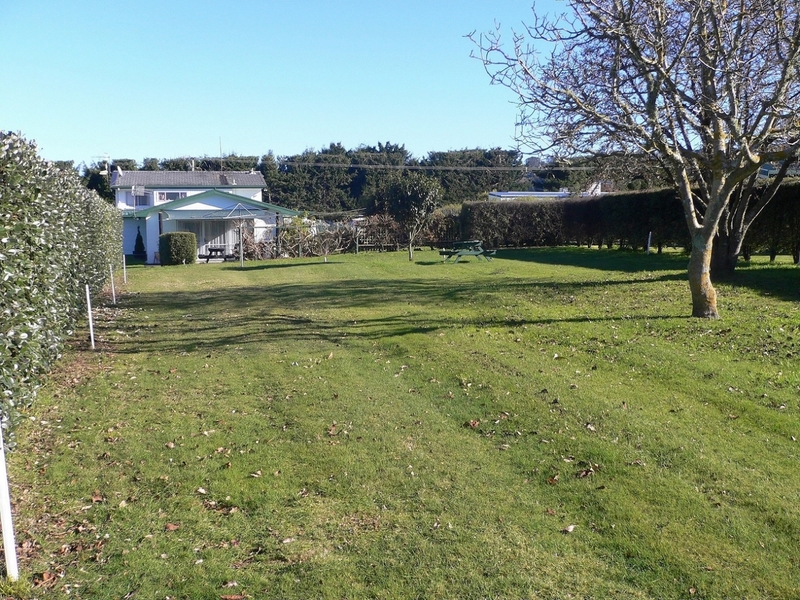 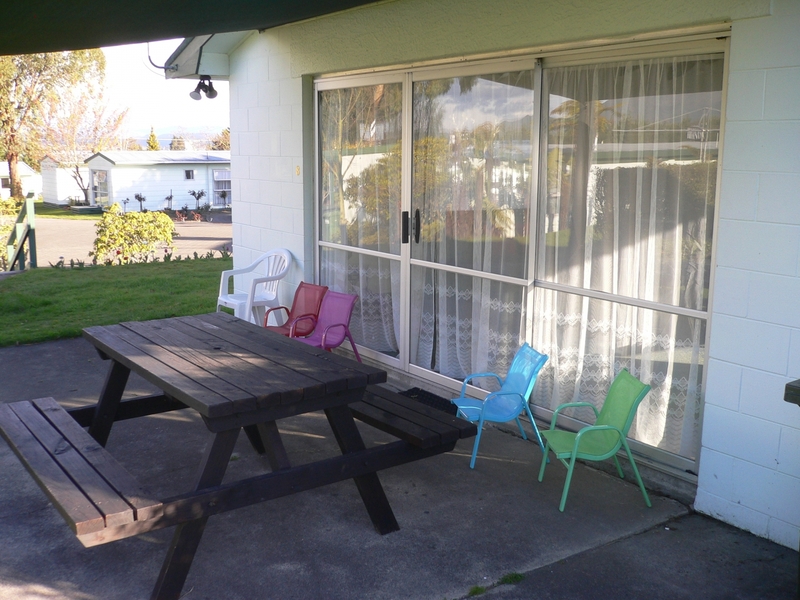 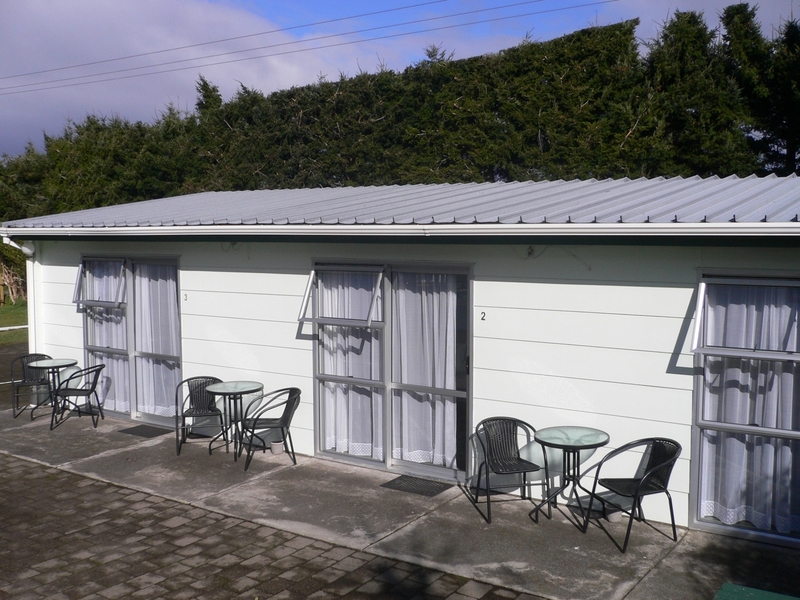 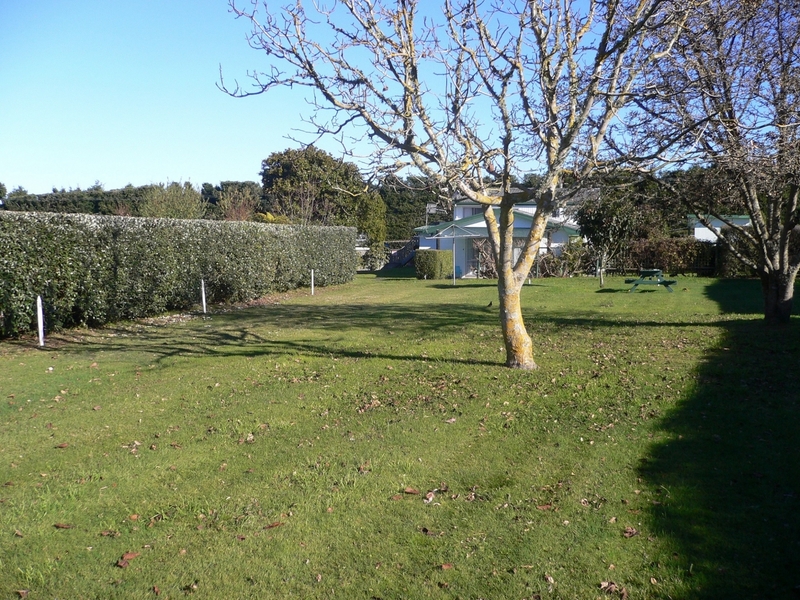 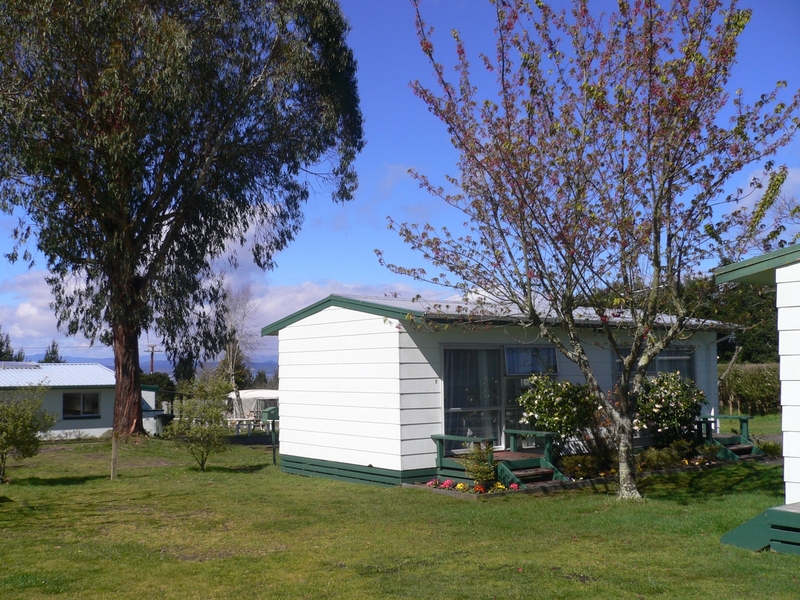 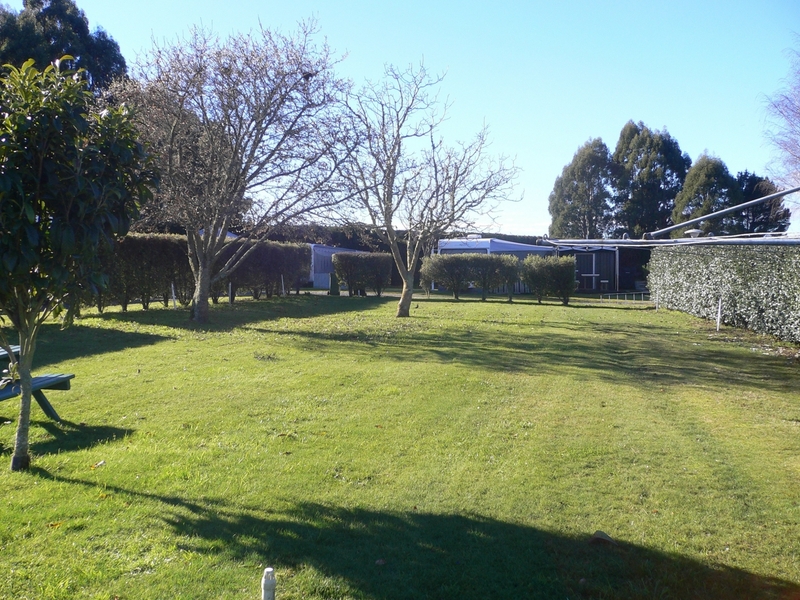 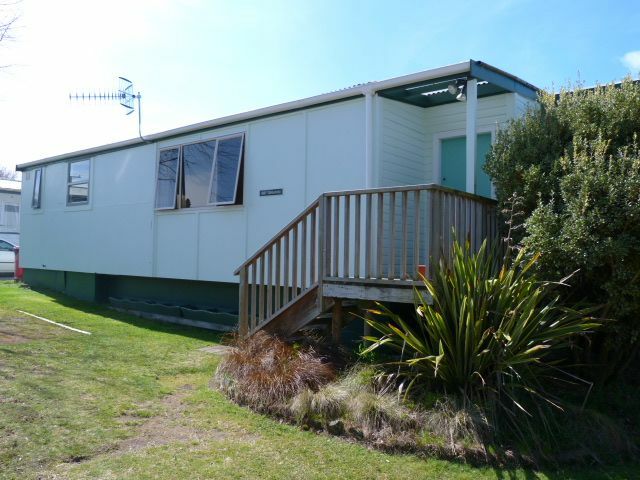 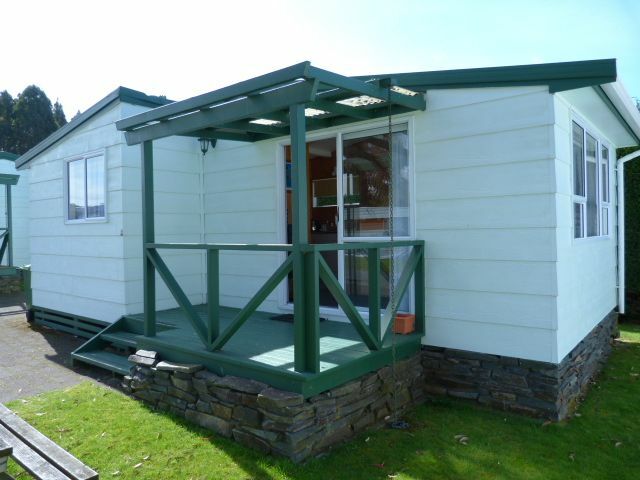 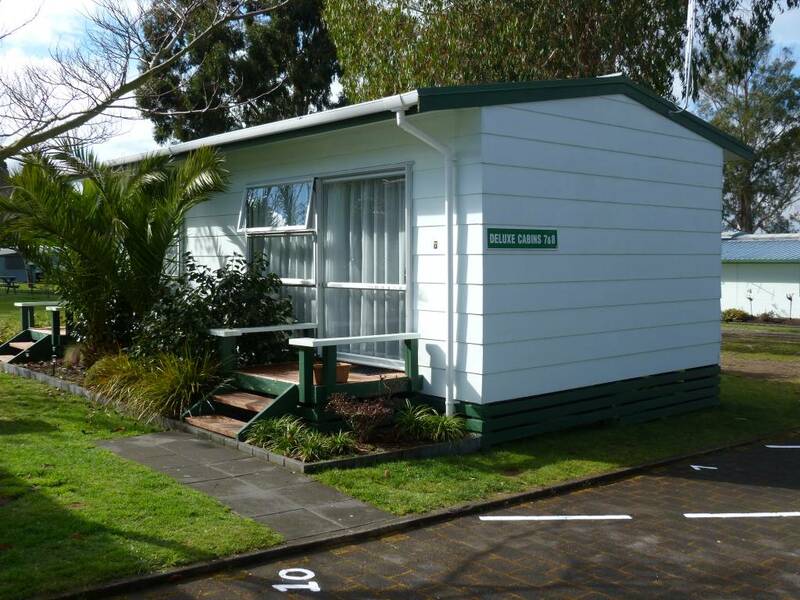 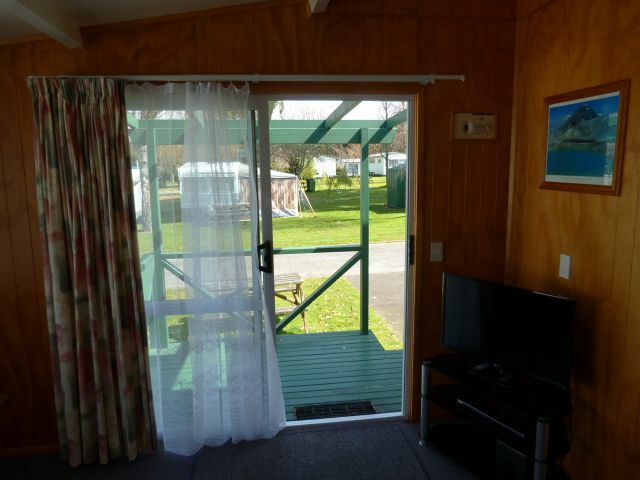 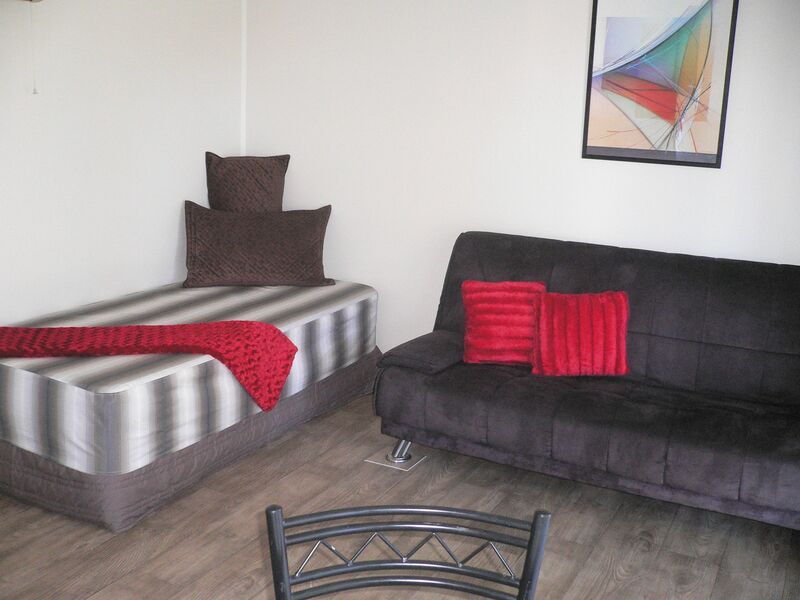 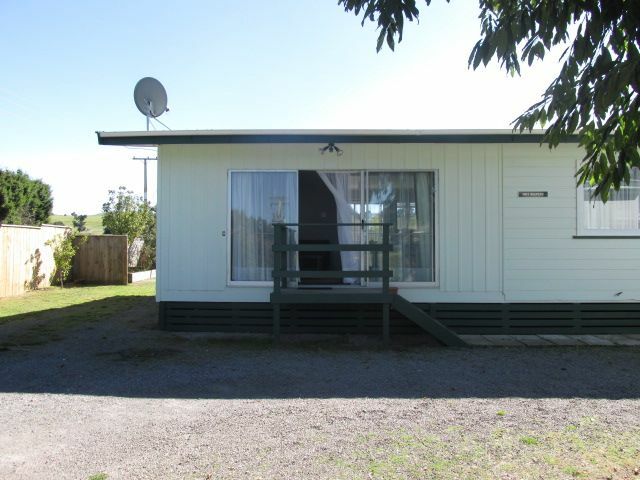 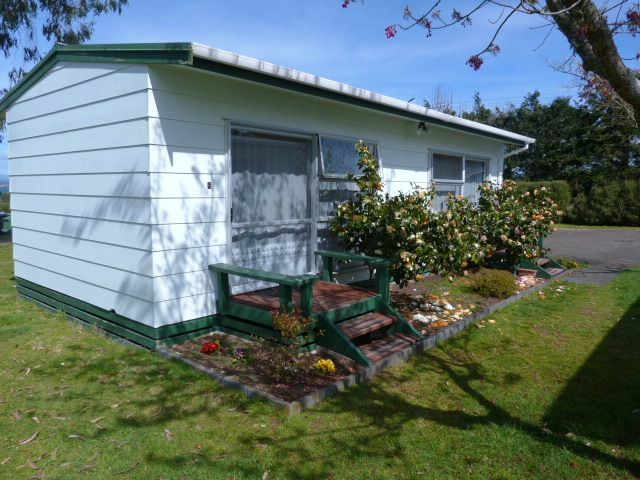 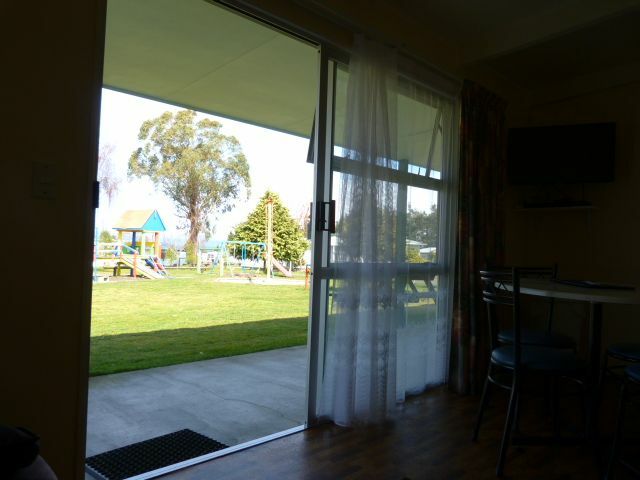 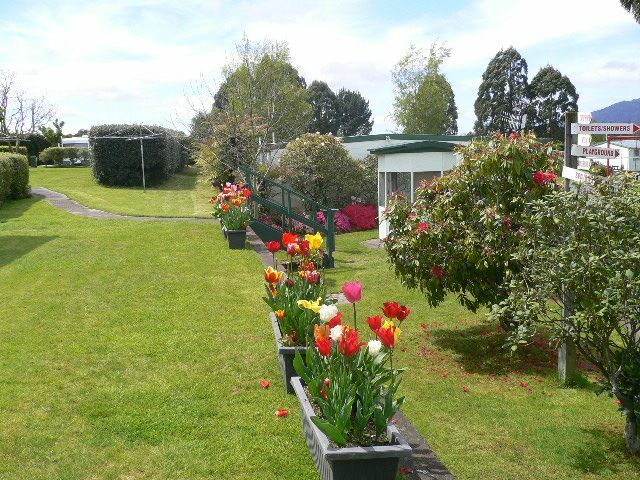 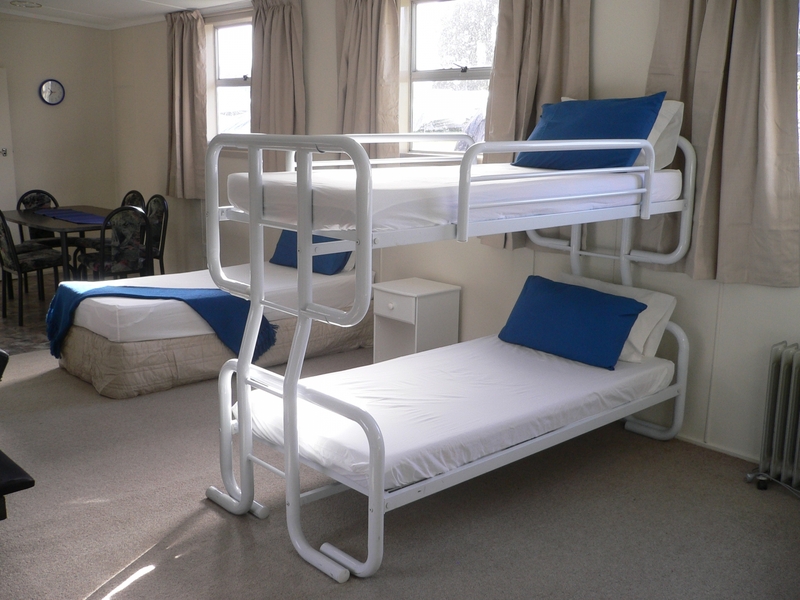 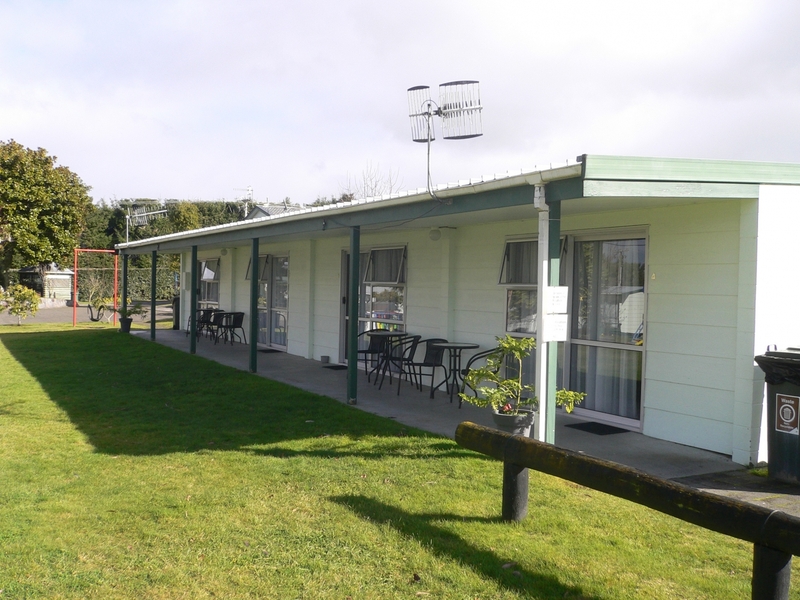 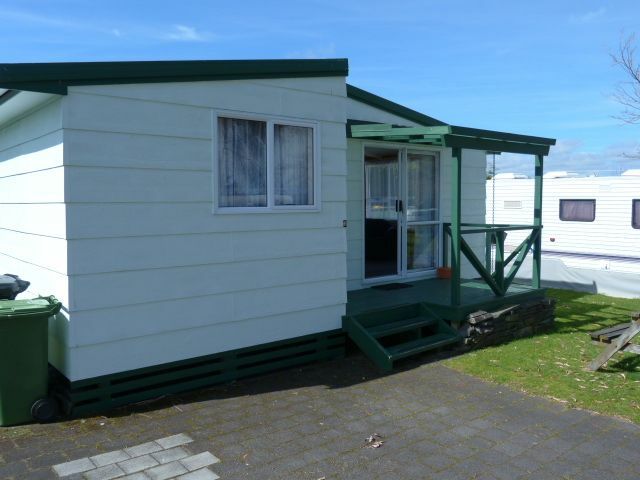 Tongariro has one bedroom with a double bed, and in the large open plan living area there is a double bunk with single bunk above, a single bunk with single bunk above, another single bunk with single bunk above, and a single bed. 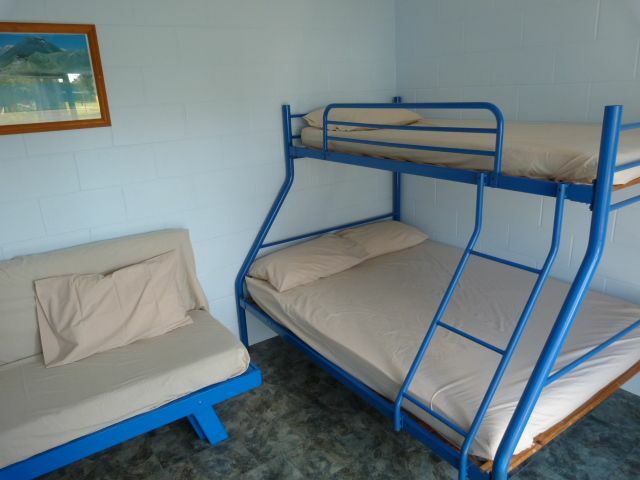 All beds and bunks have a bottom fitted sheet and pillow. 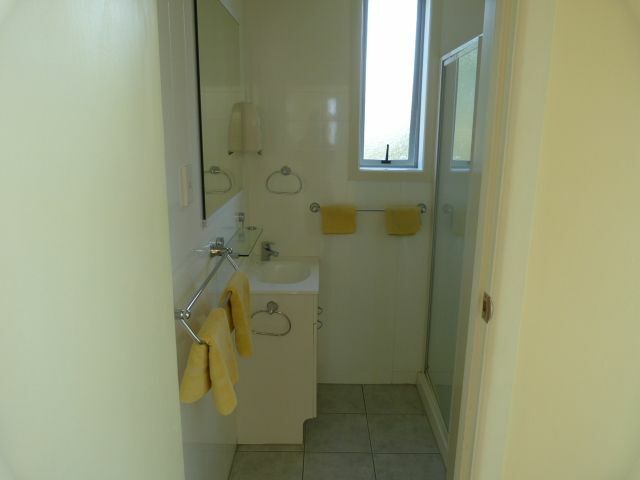 Bathroom with shower, toilet and vanity, plus another separate toilet. 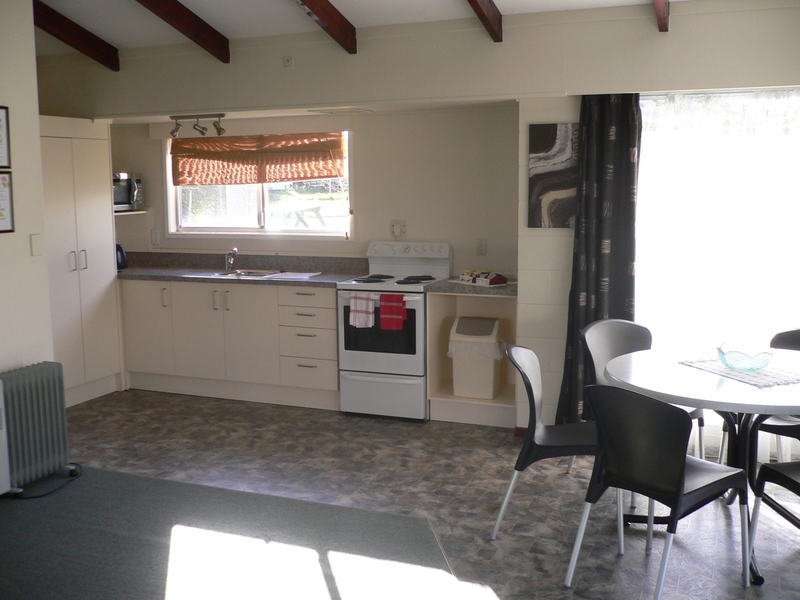 Kitchen fully equipped with full oven, fridge/freezer, microwave, tea/coffee making facilities, crockery, cutlery & utensils, pots and pans. 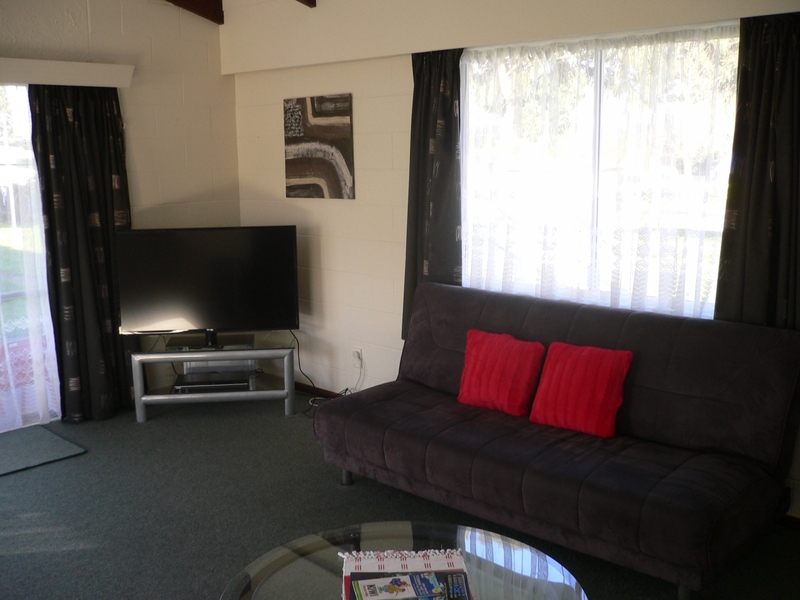 Living area has two sofas, t.v., dvd player, heaters, table & chairs. 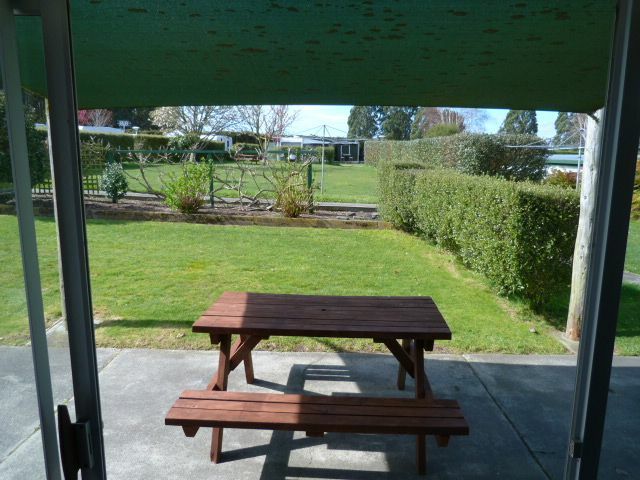 Outside table with shade net. 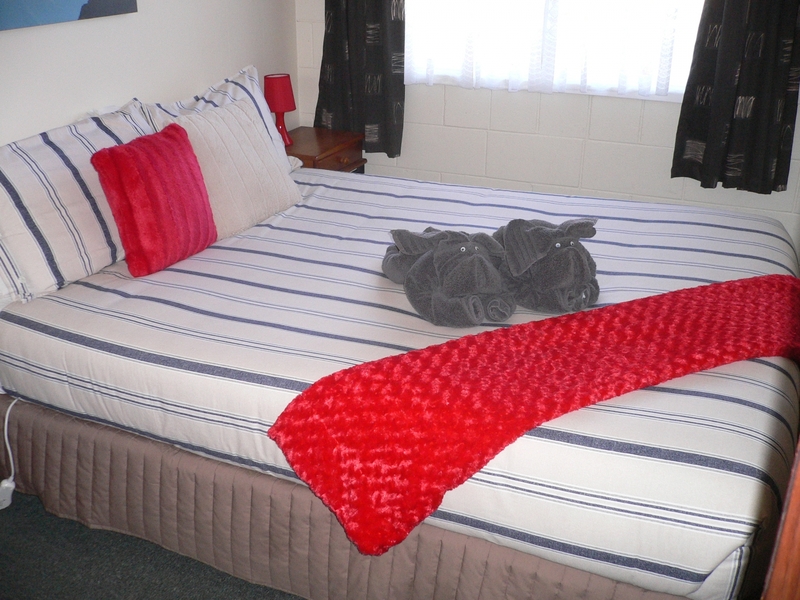 Bedroom 1 has a queen size bed fully made up with towels supplied. 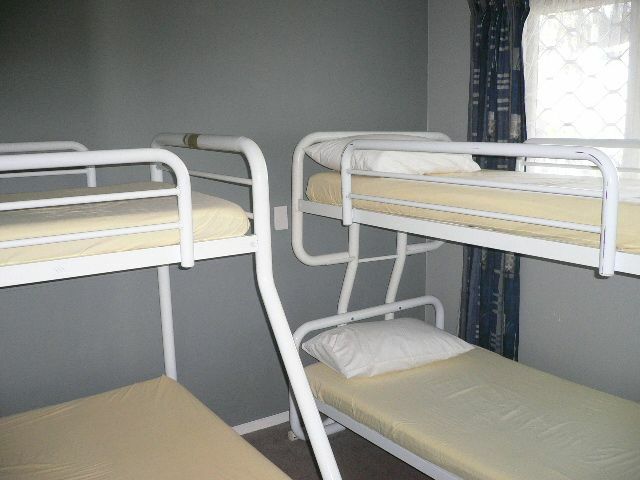 Bedroom 2 has four single bunk beds. 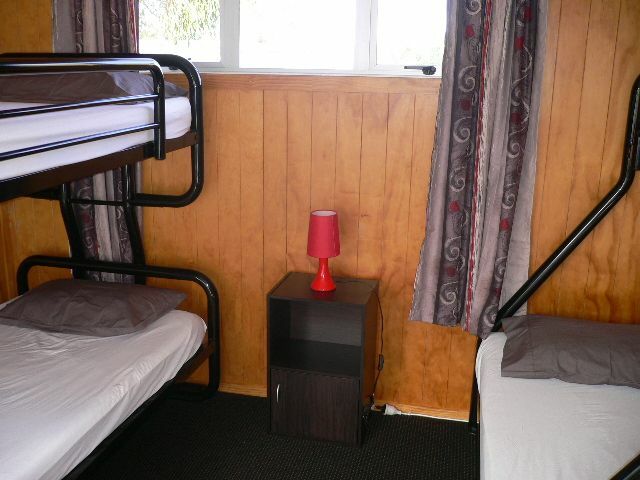 Linen required for single bunk beds, pillows and bottom sheets provided. 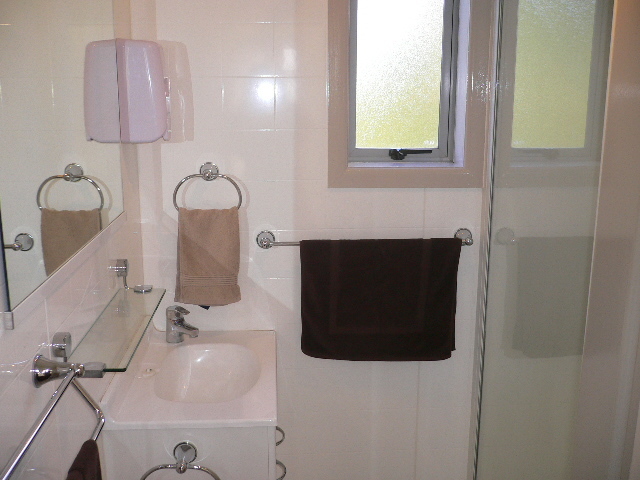 The bathroom has a shower and vanity. 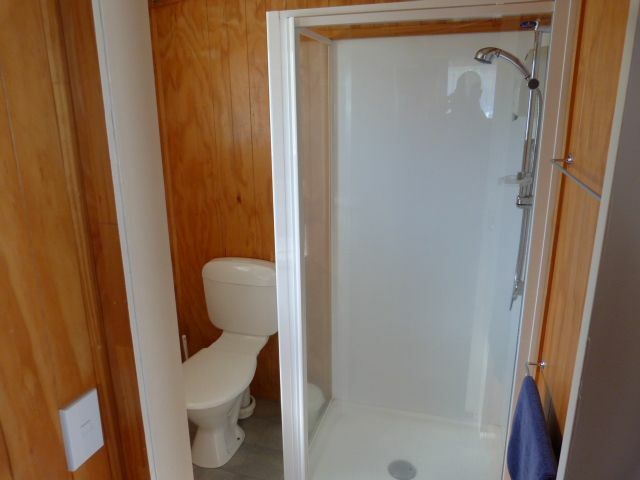 The toilet is separate. 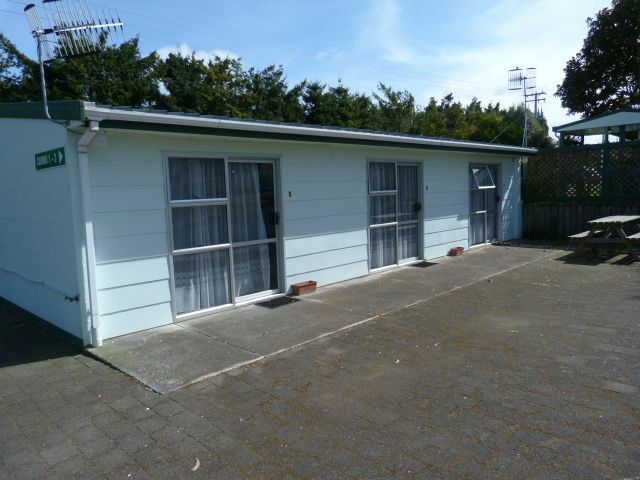 Recently refurbished, Lovely spacious accommodation with its own private outdoor area. 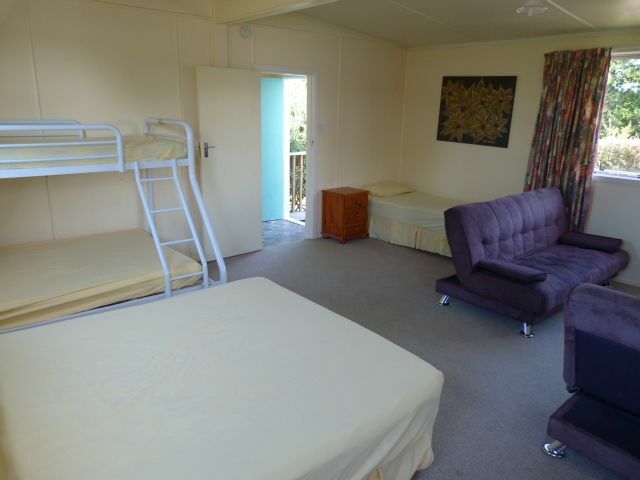 Bedroom 1 has a double size bed. 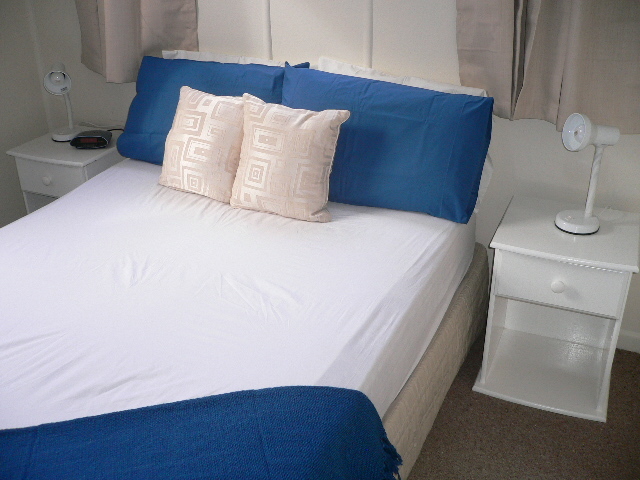 Linen required for all beds, pillows and bottom sheets provided. 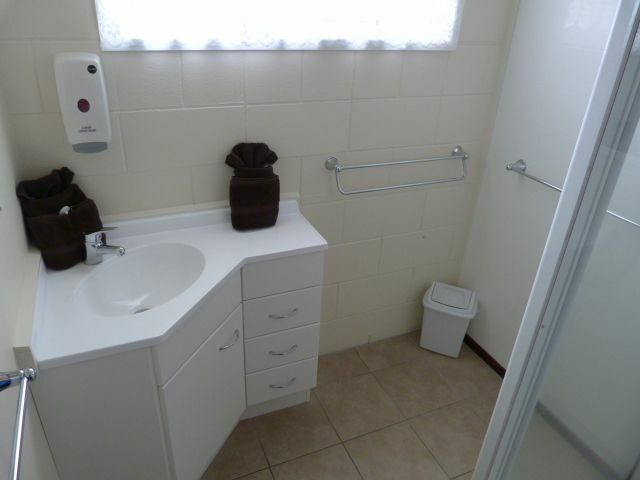 The bathroom has a shower vanity and toilet. 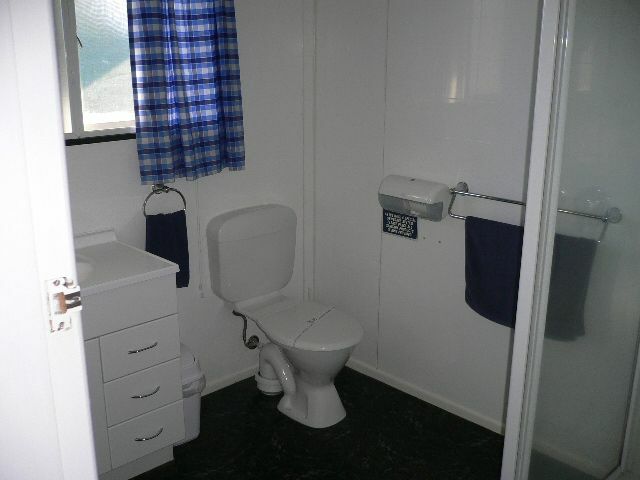 There is also a second separate toilet. 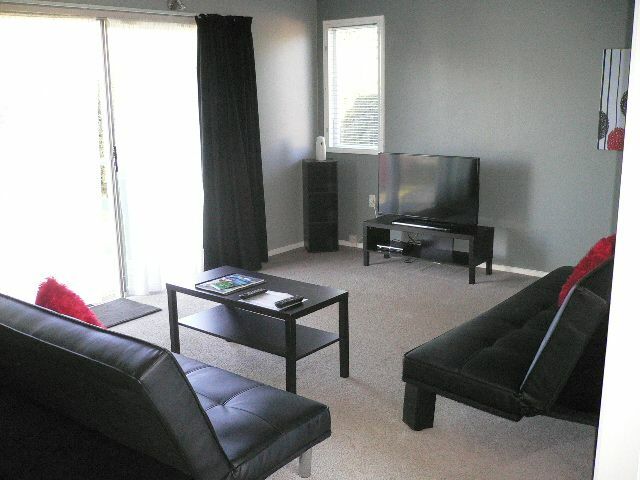 Living area has two sofas, t.v., heaters, table & chairs. 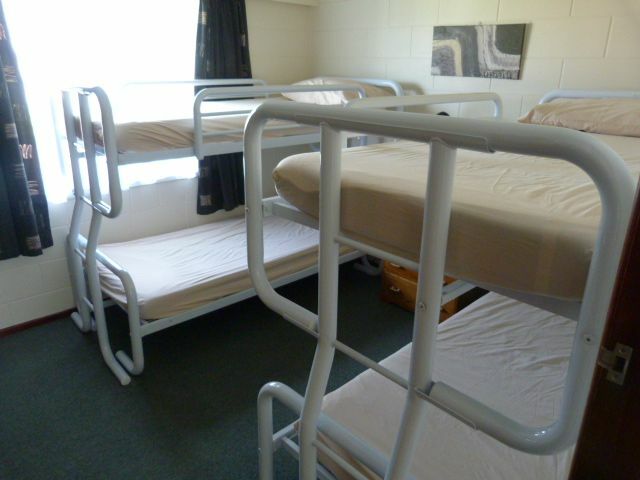 Single sleeping area, double bed with single bunk above and two more single bunks. 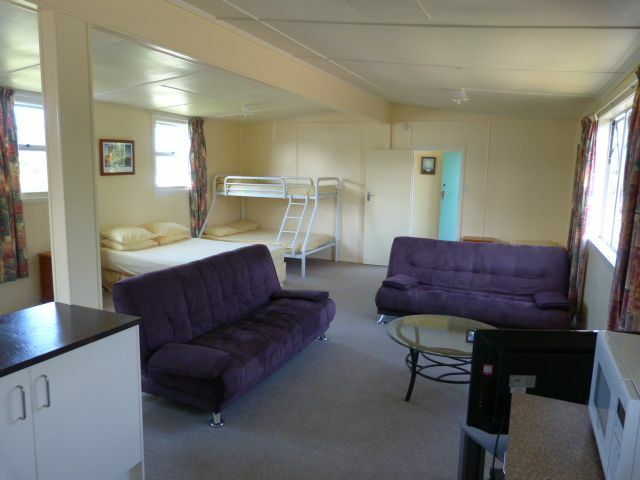 Linen required, pillows and fitted sheets provided only. 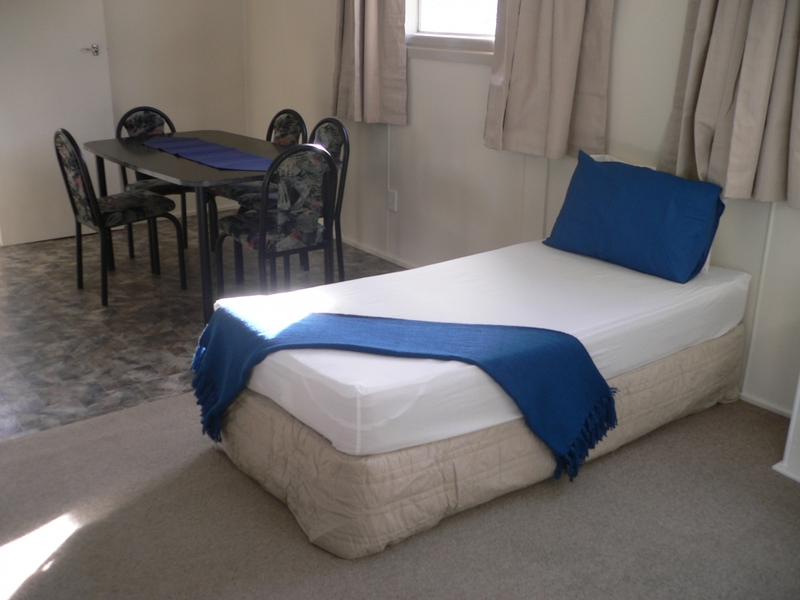 Linen available for hire at $6 per person per night. 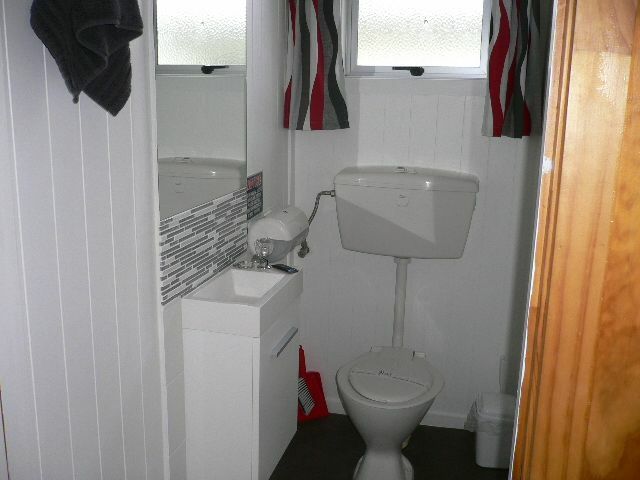 Own toilet and hand basin. 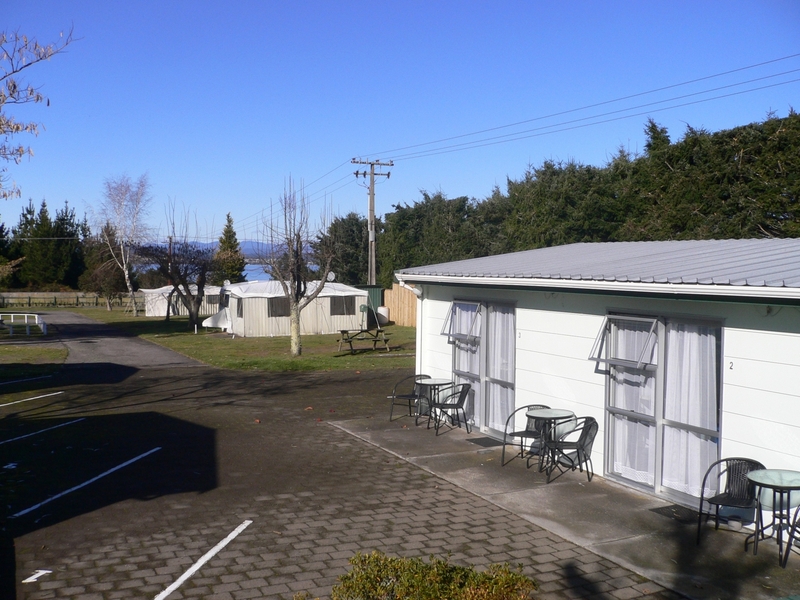 Guests use communal showers and camp kitchen. 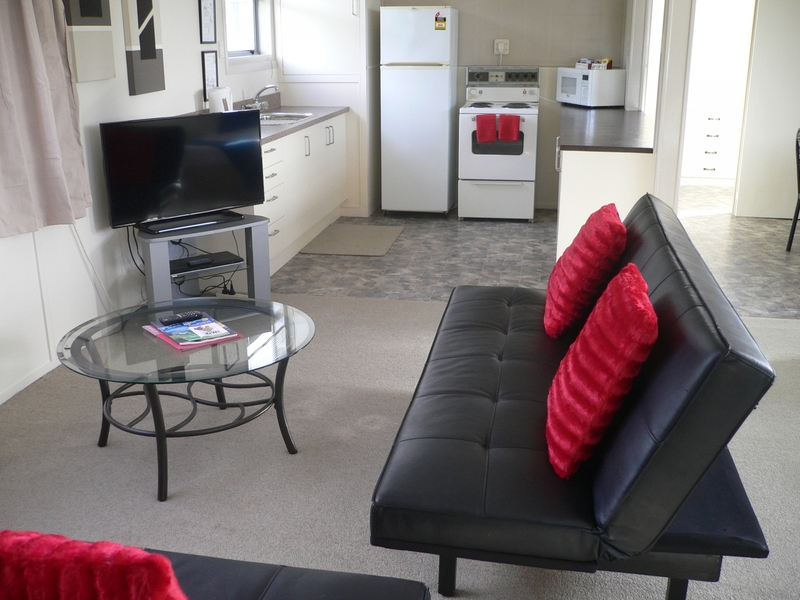 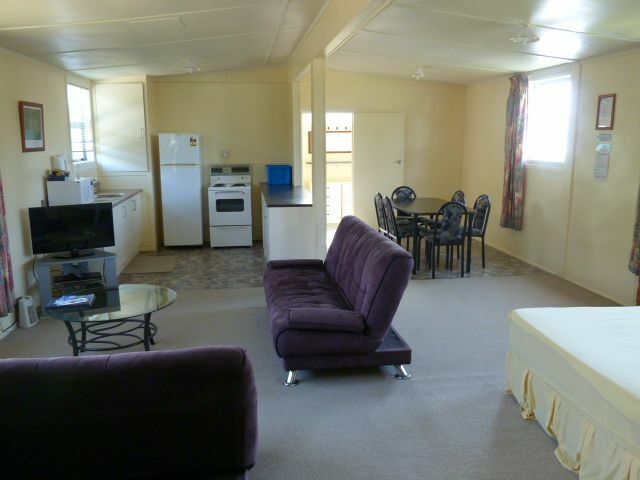 Cabin has TV with built in DVD player, fridge, tea/coffee making facilities, toaster, heater, table & chairs. 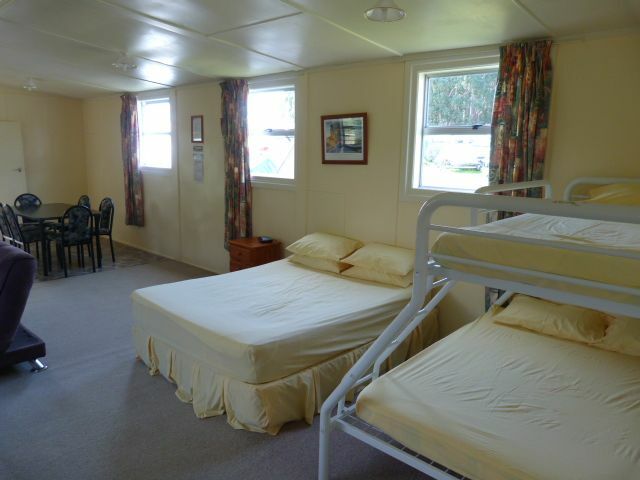 Cabins have a double bed with single bunk above and a pull out divan bed. 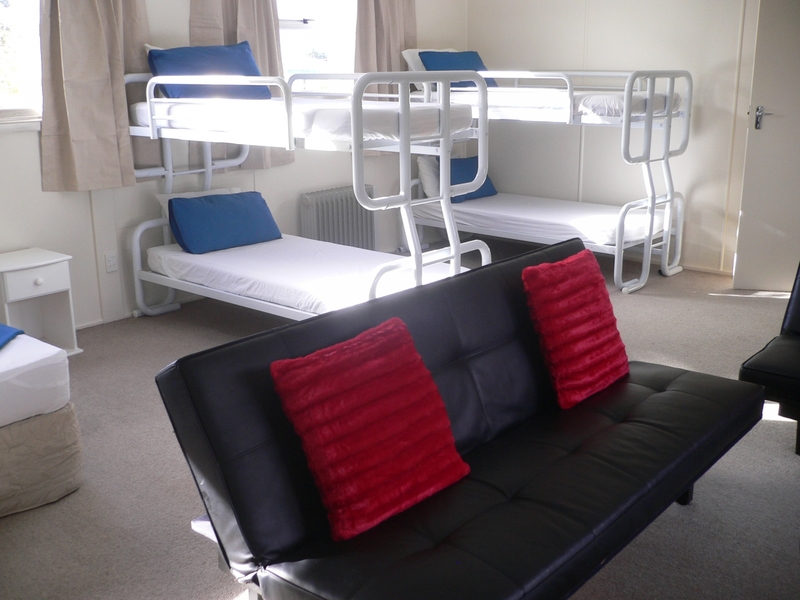 Equipped with TV, heating, fridge, tea/coffee making facilities, table & chairs. 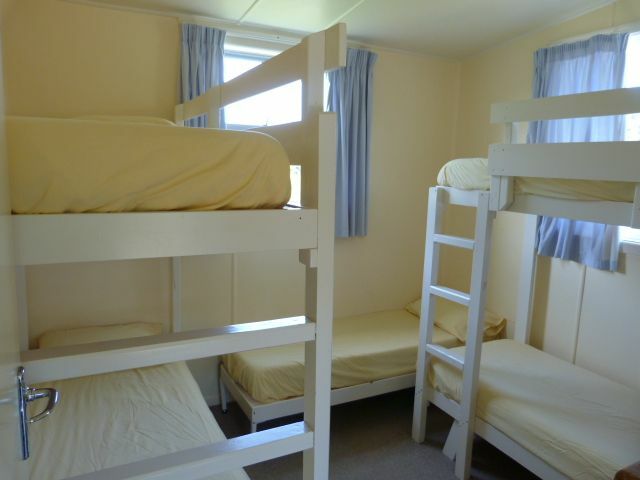 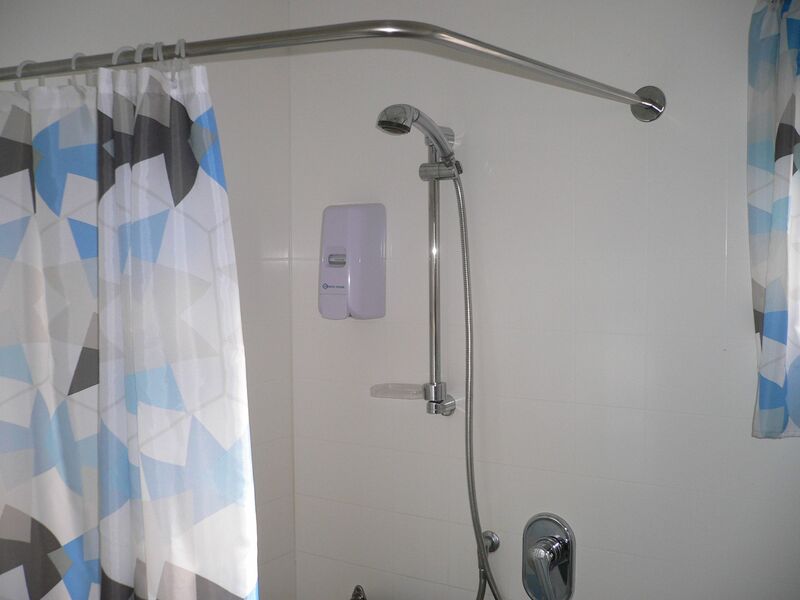 Guests use communal showers, toilets and camp kitchen. 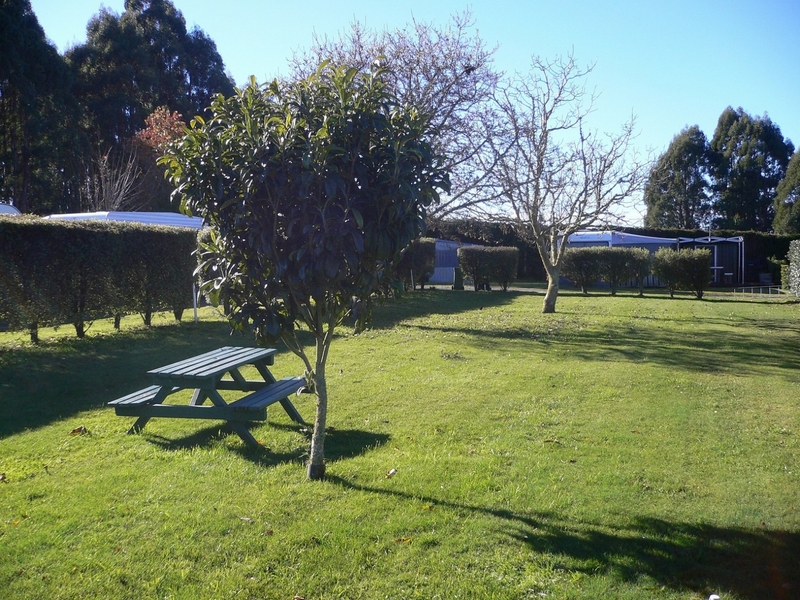 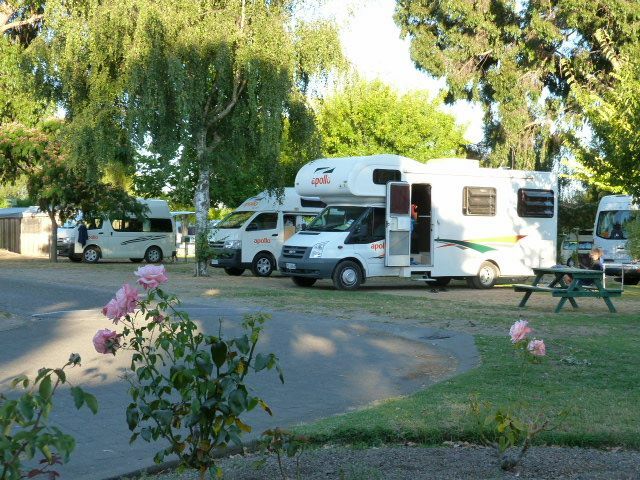 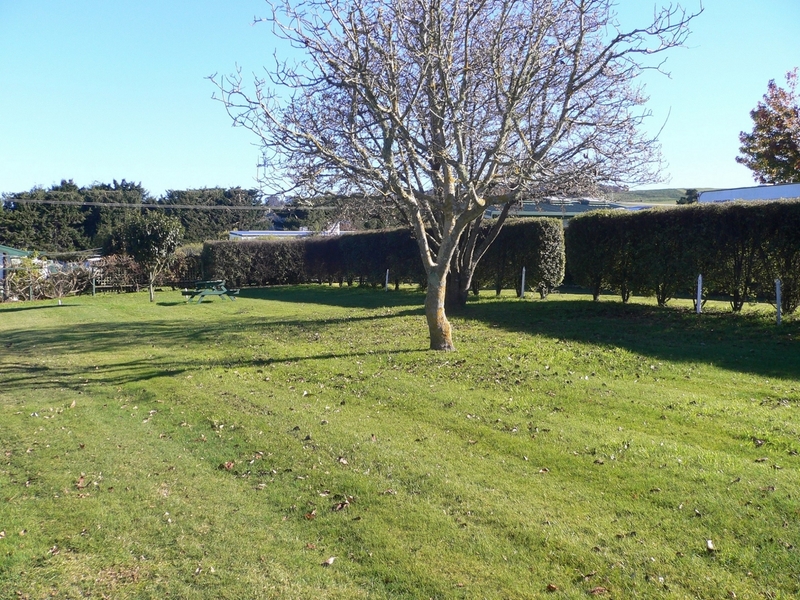 Our powered sites at Great Lake are spacious camping sites set amongst our large trees & garden areas. 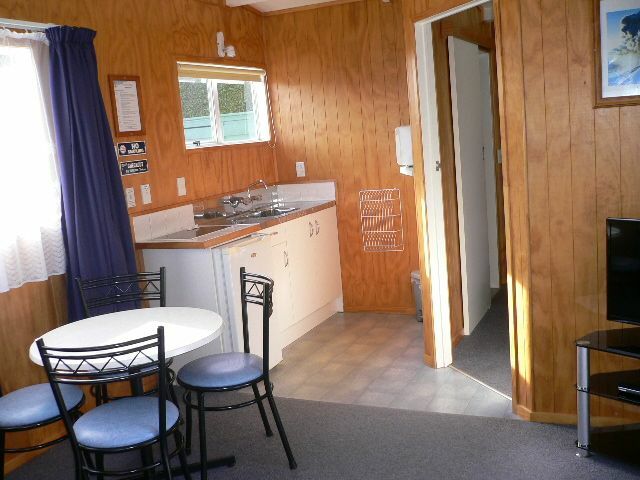 These camping sites are approx. 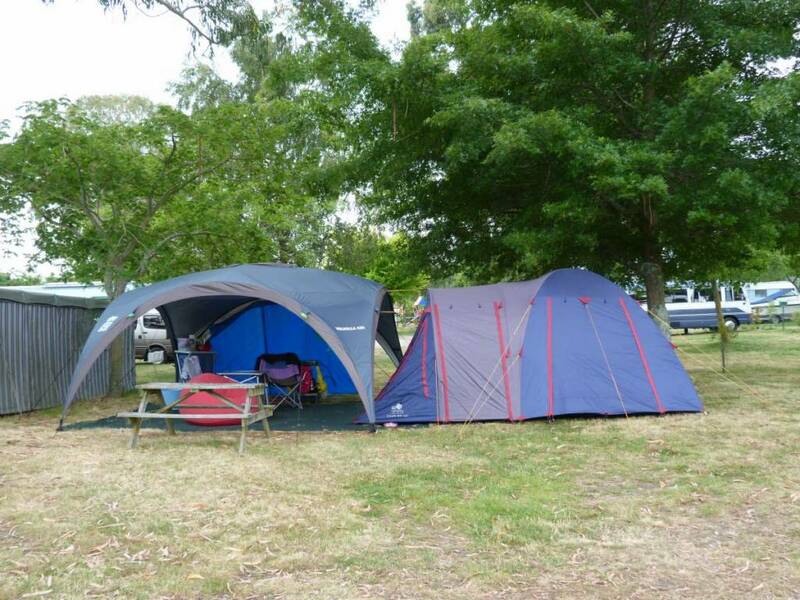 8.5 mtrs x 8.5 mtrs, and they are suitable for RVs, Motor Homes, Campervans, Caravans & large family tents. 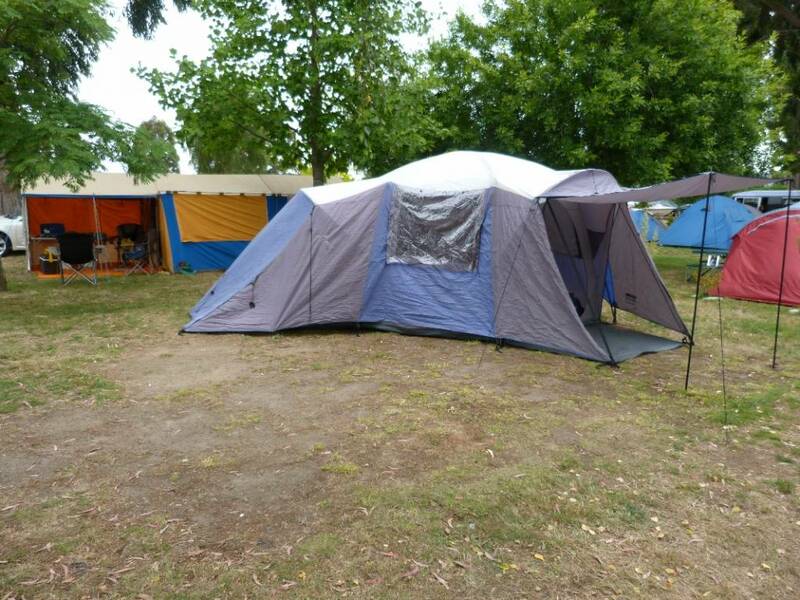 A great camping experience. 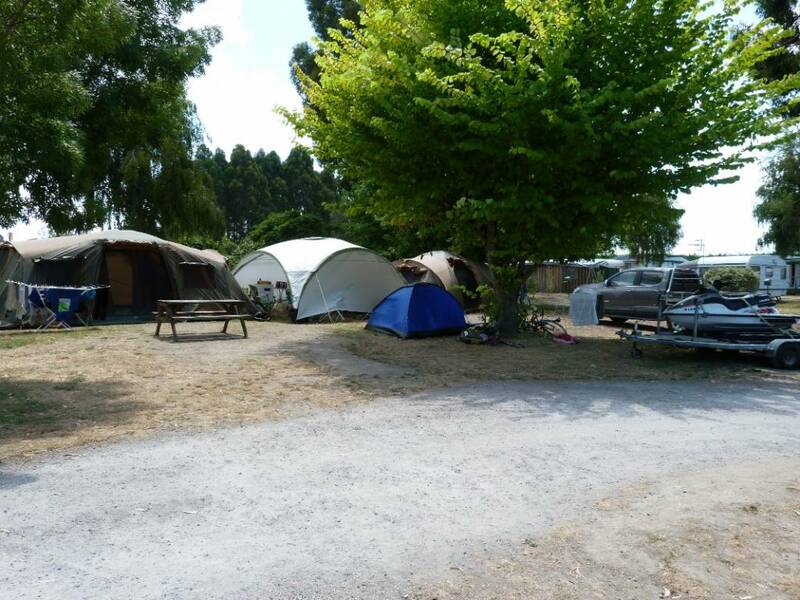 Our powered camping sites have a water connection for your convenience & there are many picnic tables scattered throughout the camping area for your enjoyment. 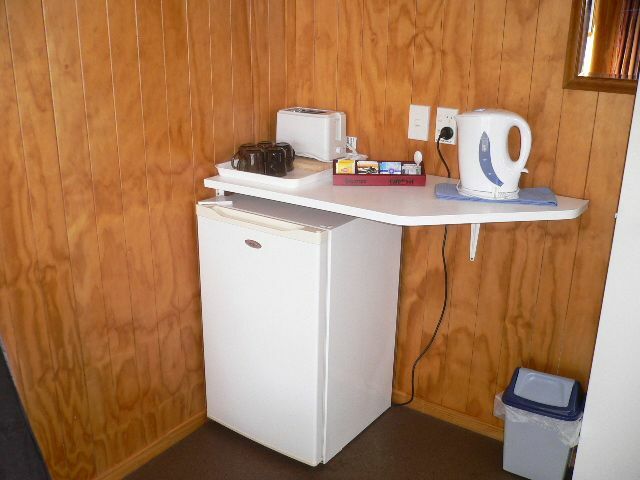 For connection to power, you must have a current warrant of fitness. 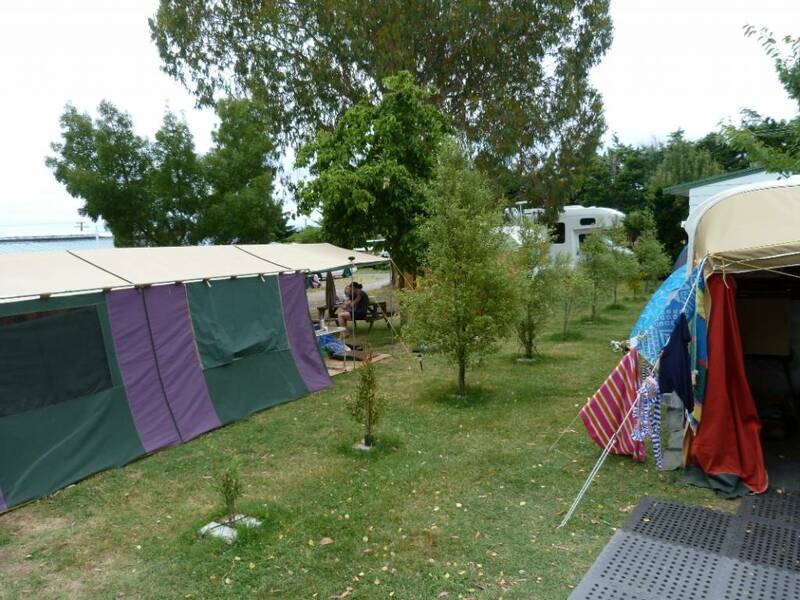 Tents requiring power must have an approved isolating transformer or residual current device with a 10 metre lead. 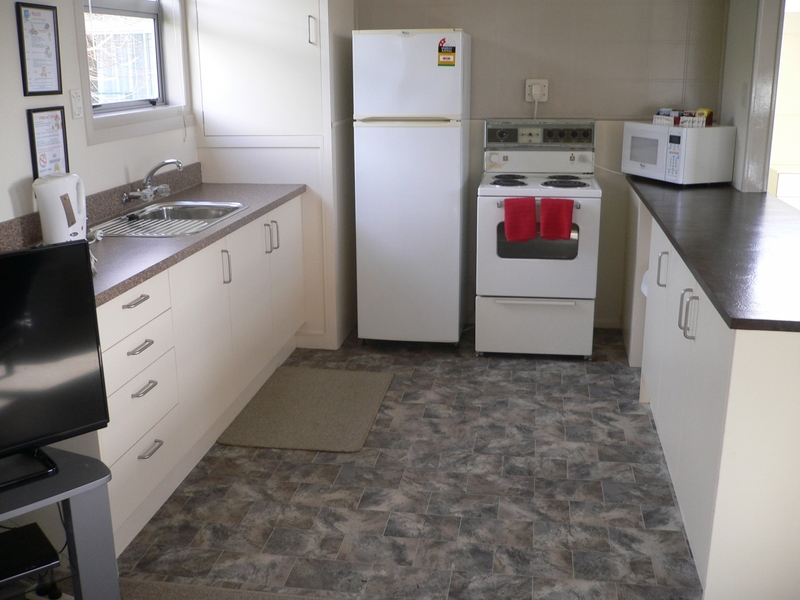 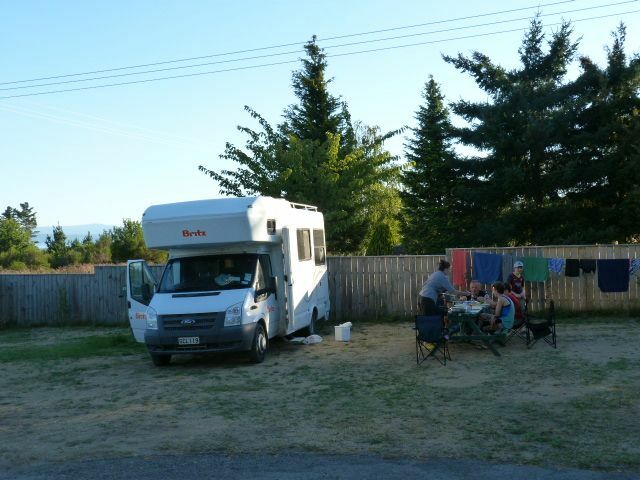 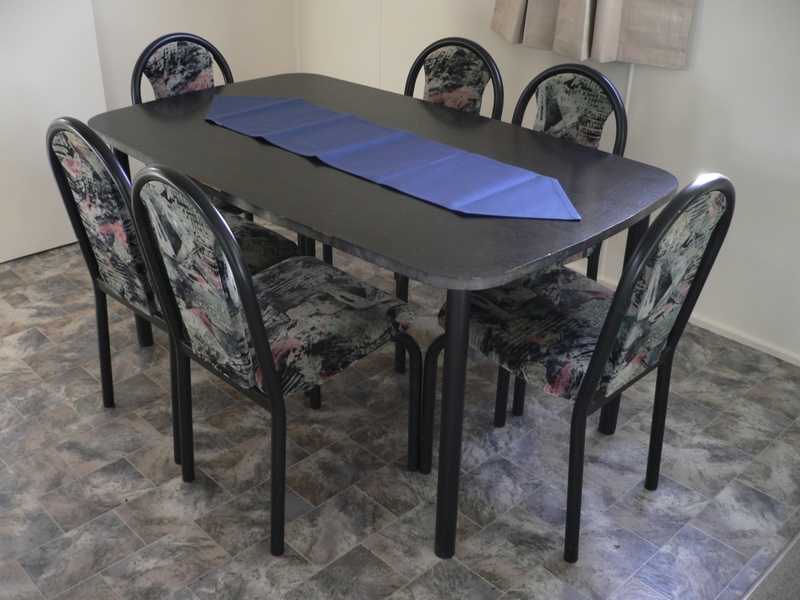 Full use of our fully equipped kitchen, BBQ's, showers, toilets, & laundry while you are camping. 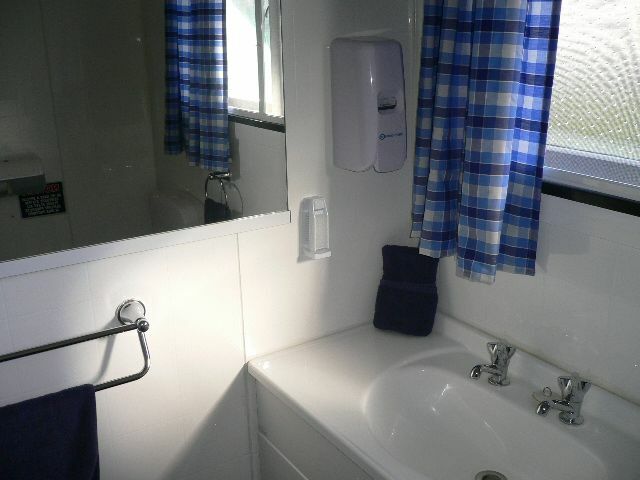 We also have an accessible private bathroom available for those needing wheelchair access, please ask at reception. 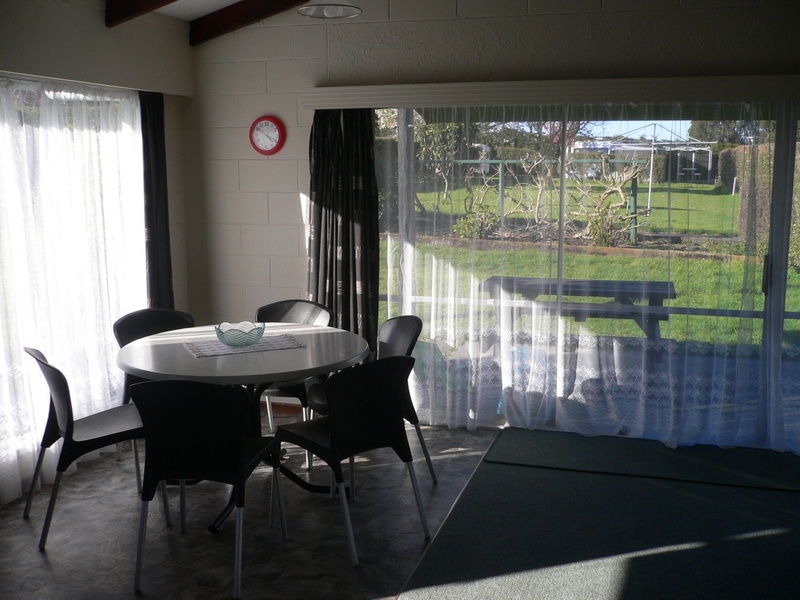 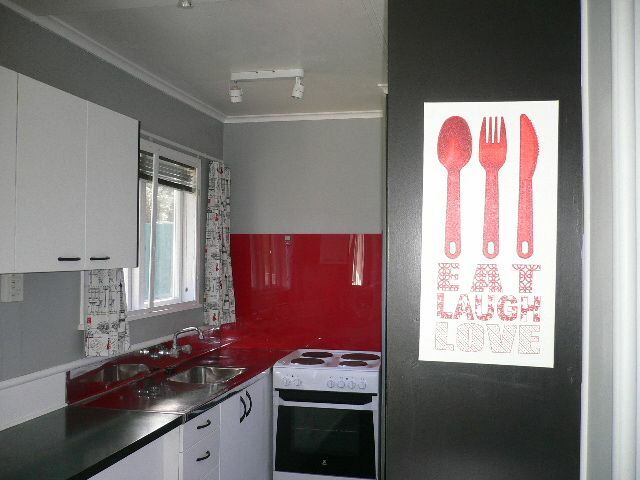 Full use of our fully equipped kitchen, BBQs, showers, toilets and laundry. 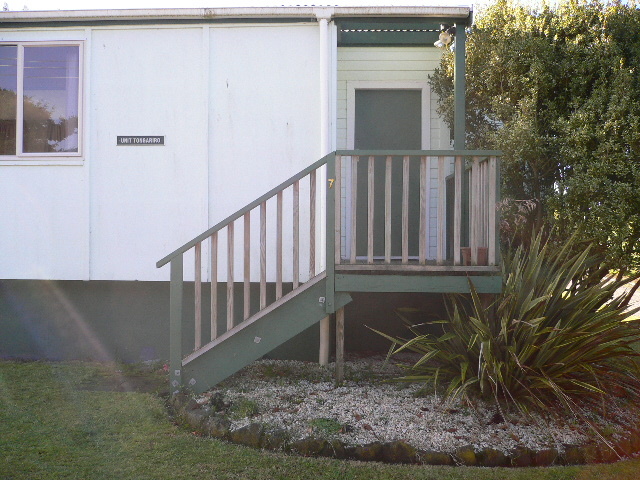 Sites only suitable for small vehicles not requiring a power supply on site. 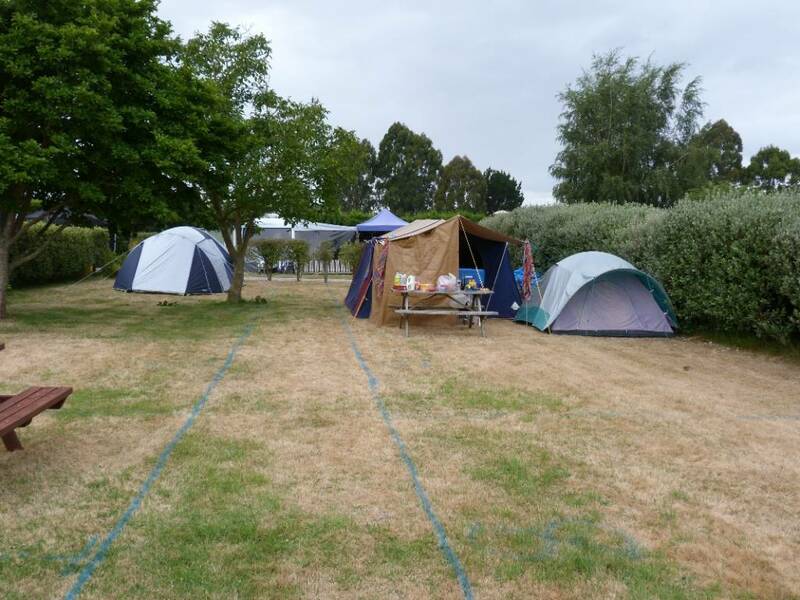 Sites suitable for tents only. 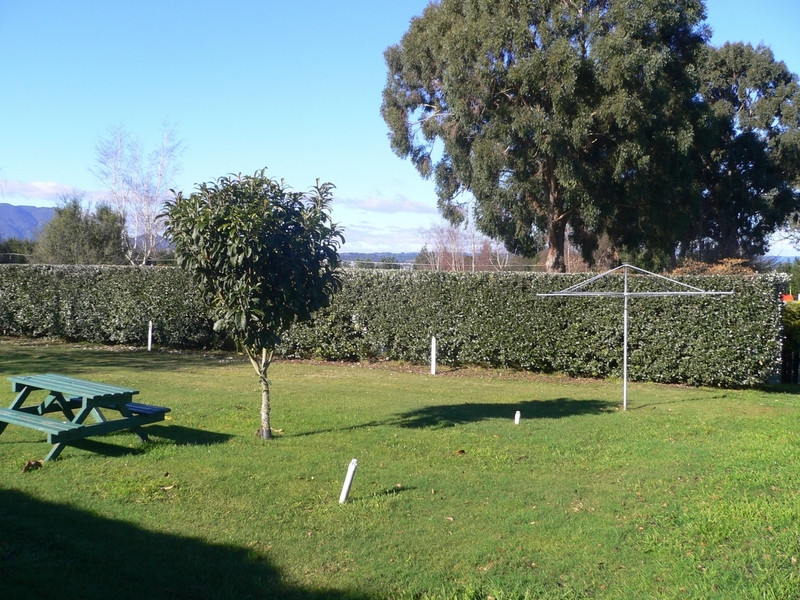 Located in a lawn area surrounded by a hedge. 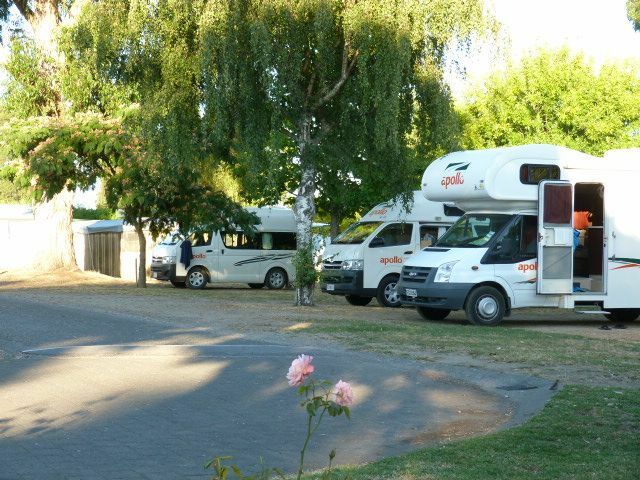 Parking for vehicles is available in a nearby area.